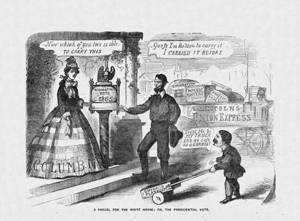 In this postdated Budget of Fun cartoon, Columbia seeks the best man to carry the “Presidential Vote.” The obvious choice is Republican Abraham Lincoln, the tall incumbent with a roomy “Union Express” already containing “Emigration,” “Monroe Doctrine,” “Pacific Railroad,” and “Emancipation.” The president’s short Democratic rival, General George B. McClellan (“Little Mac”), presents only a child’s small wheelbarrow. McClellan is not strong enough, and his “Chicago Platform” not large enough, to carry the vote. The use of “1865” may mean either the Electoral College vote or the March inauguration, rather than the popular vote in November 1864.